My brother's house is all beige. It makes me uncomfortable. Indeed. An all-beige room is too much like a sensory deprivation chamber. Ah, good descision! I'm sure you will find something comfortable and fitting. Thanks. It may take some time to find the right pieces, but it will be fun to look around for a while. Getting them home will be the challenge! I know the feeling about finding a couch etc. It took me months to find a sofa that was black and that I liked. Love the bat pillow on your chair - did you make it yourself? I bought the bat pillow at Target last Halloween season. Like the bat in the couch.. :) Love it. Awww bat pillow!!! 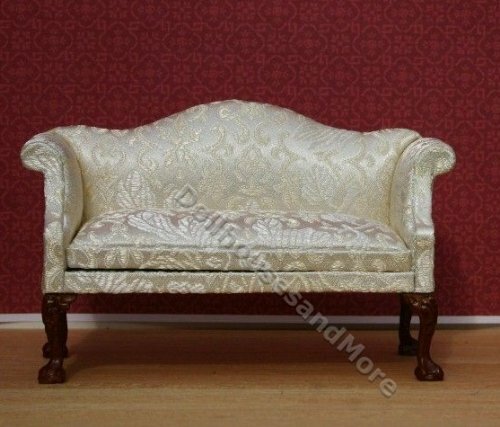 So cute ^-^ I love antique furniture but I'm always weary about purchasing a piece. I find it's usually because they're uncomfortable, they smell, or they have bed bugs X( The last piece I did buy was an antique dresser and no amount of anything could get the smell of musty attic out of it :( I look forward to seeing you new pieces! I don't worry about wood furniture because I can scrub and paint it. But I am wary of used upholstered pieces. Any sofa I buy would probably need to be reupholstered, so all the potentially bug-containing fabric and stuffing would be replaced. When I lived in hot, humid Georgia, I would never consider buying a used sofa. But here in Colorado, it's very dry and the winters are freezing, so mold and bugs don't seem to be much of an issue. Finding old, vintage or antique furniture is so much better than new stuff most of the time. Remember that you can re-cover stuff too, if it's not in a color/fabric you like. There's even fabric spray paint out there that's easier to do, but looks really good. Love the batty, target has such great finds around Halloween time. Good luck on your search for furniture, cost plus-world market has some awesome couches right now including a grey velvet one that I recently fell in love with! How exciting! I hope you find something perfect. I love your analogy for the couches at the big box stores. Booorrr-ing. I'm sure you'll find something. Can't wait to see pics. 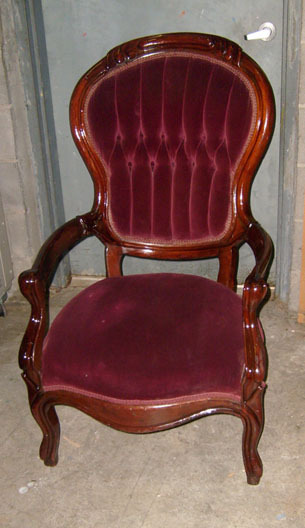 Yeah, I came across a picture of a similar chair that had been stenciled. No doubt it would be a fabulous "conversation piece" chair, but I'm too practical to have a chair that can't be used as a chair. ;) Fabric paint might be the solution? My home is just the same as TanteFledermaus describes hers; all beige and drearily bland... the only thing setting my home aside is the amount of mounted weaponry on the wall... but you know, that only goes so far. On the one hand, we did recently move in; so life may yet gothify for me in this home! Lol! Such an entertaining rant, and SO TRUE. Mr. Kitty bought a black leather overstuffed couch shortly after we started dating, to my great horror. Sure, it was black, but... It didn't last long after we got our house. My rule is, "If it isn't antique, it had better LOOK antique!" The modern overstuffed style is just too casual for my taste. I want something a bit dressier; more parlor, less den. Dogs can always be counted on to find the most comfortable seat and/or the seat that shows hair the most. Part of me wants a really nice (maybe velvet) couch, which the dog would not be allowed on; the other part wants a couch where I could cuddle with the dog. The latter will probably win. The latter two sofas/ chairs are beautiful, just the kind of thing I have always wanted. At the moment i have a second hand leather sofa that is aesthetically pleasing but gives me back- ache. When I have money, I will get a new one that doesn't hurt!